Terri talks with Kerry Rupp of True Wealth Ventures about how True Wealth Ventures views women’s health, the opportunities and challenges in the space, and how innovators need to have a more customer-centric approach earlier in the innovation cycle. Kerry Rupp is General Partner at True Wealth Ventures, an early-stage VC fund investing in women-led businesses in consumer health and sustainability. She teaches for the NSF I-Corps program, mentors startups, and consults on innovation and strategy. Kerry was previously CEO at DreamIt, a Top Ten US startup accelerator and VC fund. She founded Holiday Golightly, a group travel service for women. Kerry holds an MBA from Harvard Business School and a BA from Duke. We need to be doing more to bring together the healthcare providers and healthcare innovators earlier in the process. Kerry can be reached through LinkedIn www.linkedin.com/in/kerryrupp or her website www.kerryrupp.com. Episode 87-removing the stigma and normalizing the conversation for women around stress incontinence. Terri talks Allison Conti of Watkins-Conti Products about her personal experience with stress incontinence that led to the creation of a medical device for women as an alternative to surgery and other uncomfortable and invasive solutions. Allison Conti is an Oklahoma-based entrepreneur who was raised in an entrepreneurial environment where she witnessed the formation and creation of sustainable businesses. The industries ranged from oil & gas exploration and development to retail, cattle ranching and commercial real estate. Allison began her professional career in print media marketing and advertising. She then transitioned to a successful career in the radio and television industry. Allison also owned and managed a small business in the construction trades. In 2015, as a mother of three, she conceived a solution for involuntary urine leakage, an issue that affects over 498 million women, worldwide. The passion and drive for this venture is based on personal experience. She designed, patented, engineered and manufactured this non-invasive, comfortable and easy to use solution that is entering the FDA approval process. Allison is dedicated to the innovation and development of affordable, effective solutions for common life-altering difficulties faced in today’s environment. Recently named Top 20 under 40 in Business Times Magazine! · Allison talks about what stress incontinence is, who it impacts, and why don’t women don’t want to talk about it, and why she is passionate about creating a better solution for women. · Allison shares the other options available to women and why she developed YoniFit as another alternative for women. · Allison talks why women would be willing to participate in the clinical trial at NYU. · Allison created LeakyLady.com to make the topic easier for investors to discuss and for women to share their stories to remove the stigma around stress incontinence. · Allison talks about the team bringing this product to market and surrounding herself with an experienced team. · Terri asks about Allison’s fundraising experience and the reactions from investors. · Allison talks about protecting her technology through patents and trademarks and expanding into global markets. · Allison shares her personal story around her condition, how many women are affected by this condition, and how it has changed her life and how she wants to change the lives of other women as well. So much of how we have approached women’s health has been about what is wrong with our bodies and with shame and we need to start talking about the conditions affecting so many women to remove the stigmas, shame, and get to better solutions. Allison can be reached via email at Allison@watkinscontiproducts.com. You can follow on Instagram @YoniFit. Read stories from other women and share your own at www.leakylady.com and sign up for email updates. Terri talks Katie McMillan of Duke Health about why she is interested in women’s health, why we are seeing an explosion in women’s health solutions, and why she sees technology as the answer to some of our healthcare issues for women. For 10 years, Katie D. McMillan, MPH has dedicated her career to imagining and building technology to improve healthcare for patients and providers. Her experience spans multi-national global health organizations, lean software start-up companies, and large academic medical centers. Katie’s latest venture is the creation of the Mobile App Gateway at Duke University Health System. Launched in the summer of 2017, the MAG serves as the hub for digital health at Duke and provides product consulting services to clinicians and researchers, monthly events and workshops, and content exploring the many facets of the health tech industry. Katie has been involved in the ideation and creation of over 75 apps. In her free time, Katie microblogs at her Well Made Health account on Instagram (@wellmadehealth exploring creativity, digital design, and Fem Tech. We women hold different roles in our lives and have different seasons in our lives which is very different from men and therefore our healthcare needs are very different as well. Katie can be reached via email at wellmadehealth@gmail.com , on Twitter @KatieDMcMillan @Wellmadehealth and DukeMobileApps and on Instagram @Wellmadehealth. 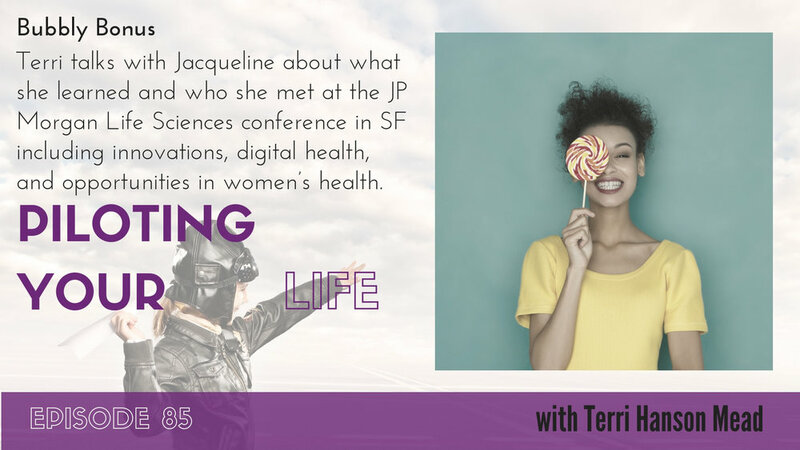 Terri talks with Jacqueline about what she learned and who she met at the JP Morgan Life Sciences conference in SF including innovations, digital health, and opportunities in women’s health. Terri talks about what the JP Morgan Life Sciences conference is all about, what she learned, who she met, and some of the trends and innovations in women’s health. Terri talks about the importance of normalization language and conversations around women’s health and wellness, including sexual health and wellness. Terri and Jacqueline talk about changing the norms around aging, especially around body image, and taking charge of our health in our midlife in setting ourselves best for life after 65. Terri is excited about how digital health is being embraced within biotech and pharma in various areas including medication adherence, better patient targeting, better clinical trial design, and better leveraging of data to optimizing drug development and delivery. They talk about data and data ownership being a big topic in 2019 and the ramifications of deals like 23andMe and GSK. Terri and Jacqueline discuss the $8.1B invested in digital health in 2018, and what is included in digital health including the blurring of lines between health and wellness. We need to normalize the language and conversations around women’s health, wellness, and body parts. You can follow Jacqueline Steenhuis on Twitter @TipsyCopilot or through her website https://www.jacquelinesteenhuis.com/. You can follow Terri on Twitter at @terrihansonmead or go to her website at www.terrihansonmead.com. 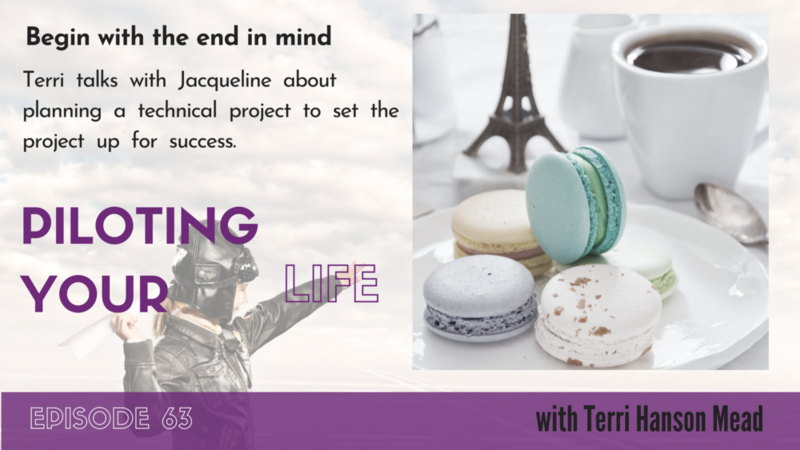 Terri talks with Jacqueline about her process for planning a technical project to set the project up for success and be able to objectively evaluate the success at the end of the project. Terri talks about having to complete her professional education hours for her PMP (project management professional) certification. She talks about writing some blog posts and putting on a webinar on planning a technology project which is covered in this episode. 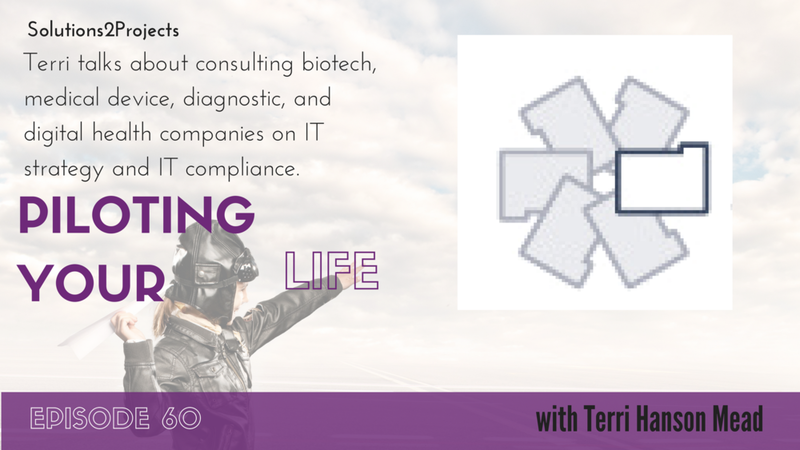 Terri talks about how she is assuming that the lead candidate has been identified and the system is either business critical, a major enterprise project, or needs to be validated to meet 21 CFR Part 11 requirements. Terri shares that she is a believer in right-sizing the planning of a project. Terri talks about starting with a project charter to get the stakeholders on the same page regarding the project and shares details about what goes into the charter. Terri talks about creating a project document for the larger projects she works on which is the guidebook / playbook for the project. Terri shares why it is important to establish the acceptance criteria and success criteria for the project at the beginning of the project to be able to objectively assess the success of the project at the end of the project. Terri explains to Jacqueline why a project plan is wrong as soon as it is generated but you need to start someplace when it is good enough. Terri emphasizes the importance of NOT signing agreements with vendors until the project is planned. Terri talks about the practical aspects of managing and planning the overall project and the importance of understanding the motivations of all of the stakeholders. Terri shares her concerns about SaaS solutions and the assumption that they are plug-and-play without taking into account the integration within the business processes. Terri is concerned about operationalizing the new system and associated processes.